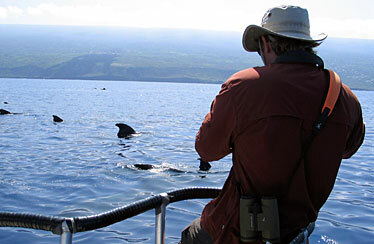 Greg Schorr, a researcher at Cascadia Research Collective, photographs a pod of pilot whales off the Big Island's Kona coast. The crew had been looking for beaked whales for a study of their vulnerability to the Navy's sonar. The Navy says a federal court ruling restricting the use of mid-frequency sonar during training exercises off Southern California does not strike "the right balance between national security and environmental concerns." "Upon early review, we are primarily concerned that the Navy's present mitigation effort of shutting down sonar altogether when marine mammals are present has been extended to 2,200 yards, and that the court has imposed a requirement to power down sonar by 6 decibels when surface ducting conditions are detected," said Cmdr. Jeff Davis, a Navy spokesman at the Pentagon, in an e-mail. He was referring to a ruling by the U.S. District Court in Los Angeles on Thursday. » A 12-nautical-mile no-sonar exclusion zone along the California coastline. » Expanded safety zone and shutdown of sonar when marine mammals are spotted within 2,200 yards. » Pre-exercise monitoring for 60 minutes each day when sonar will be used. » Two lookouts trained by the National Marine Fisheries Service during exercises. » Aerial monitoring before and during exercises. » Helicopter monitoring for marine mammals for 10 minutes before deployment of sonar. » Excluding the use of sonar from Catalina Basin, an area of high marine mammal density. "We have said from the beginning of this litigation that the Navy can meet its training objectives while substantially increasing protections against unnecessary harm to whales and other marine mammals," said Joel Reynolds, director of the Marine Mammal Protection Project at the Natural Resources Defense Council, which filed the lawsuit. Davis said: "Despite the care the court took in crafting its order, we do not believe it struck the right balance between national security and environmental concerns. The Navy position continues to be that it is possible to protect marine mammals while also preserving national security." On Nov. 13, the 9th Circuit Court of Appeals ordered the Navy not to use high-intensity sonar in its future training exercises off Southern California until questions over likely harm to marine mammals could be resolved. The appeals court ordered the District Court to impose mitigations on the Navy exercises sufficient to "provide adequate safeguards for the protection of the environment." A coalition led by NRDC in early August won an injunction from the District Court, which concluded that without adequate measures to protect marine life, the Navy's use of high-intensity sonar during training exercises likely violates federal environmental laws. In late August, a three-judge panel of the Court of Appeals granted a stay of injunction, allowing the Navy to use sonar during its exercises. That stay was reversed Nov. 13.